Ed Vul works at UC San Diego in the department of Psychology, he wrote a nice paper with his colleagues in 2009 called Puzzlingly High Correlations in fMRI Studies of Emotion, Personality, and Social Cognition. Functional magnetic resonance imaging (fMRI) studies of emotion, personality, and social cognition have drawn much attention in recent years, with high-profile studies frequently reporting extremely high (e.g., >.8) correlations between brain activation and personality measures. We show that these correlations are higher than should be expected given the (evidently limited) reliability of both fMRI and personality measures. 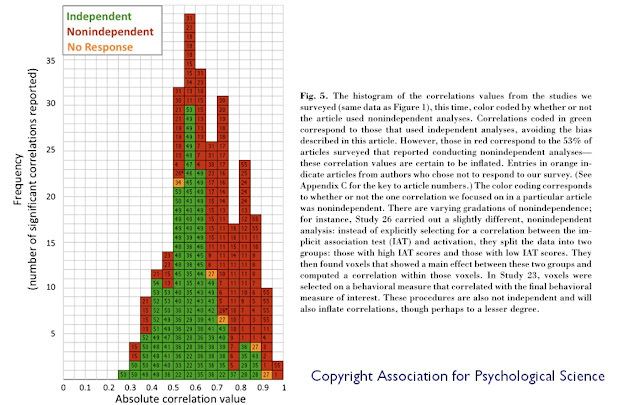 The high correlations are all the more puzzling because method sections rarely contain much detail about how the correlations were obtained. We surveyed authors of 55 articles that reported findings of this kind to determine a few details on how these correlations were computed. More than half acknowledged using a strategy that computes separate correlations for individual voxels and reports means of only those voxels exceeding chosen thresholds. We show how this non-independent analysis inflates correlations while yielding reassuring-looking scattergrams. This analysis technique was used to obtain the vast majority of the implausibly high correlations in our survey sample. In addition, we argue that, in some cases, other analysis problems likely created entirely spurious correlations. We outline how the data from these studies could be reanalyzed with unbiased methods to provide accurate estimates of the correlations in question and urge authors to perform such reanalyses. The underlying problems described here appear to be common in fMRI research of many kinds—not just in studies of emotion, personality, and social cognition. Figure 5 from the paper is shown below.